What Are Different Types of Sorting Used in C Programming? There is a list of 5 types of sorting techniques used in C programming Language. In programming, sorting of elements is highly effective to come up with arranged data. Different types of sorting used in c programming. It makes searching a data fast and easy along with saving time for a programmer. The two important types of sorting include internal sorting and external sorting. Main memory is used to store the data associated with these sortings. Here, a proper selection of an algorithm is effective to minimize the CPU cycle and save the time and effort in writing a C program. Don’t just look for bubble sort in C with an example, to embrace a simple solution. There are other forms of sorting algorithms helpful in programming. Here we are going to a list of different type of sorting in C language. It starts with finding the minimum or maximum data in a list. It is compared with each element in the list and swapped with the one where the selected minimum has to be placed. Every time after the right placement, the algorithm again finds a new minimum out of the remaining data and repeats the process to come up with a sorted list in the end. Two adjacent elements in a list are compared and then arranged in a sorted way with the minimum data above. Then, in the next pass, the process is performed on the next pair apart from the sorted data. All out-of-order elements are sorted using. In this algorithm, you start with the first element and then traverse through every element in an array. In the process, if an element is found out-of-order, it is inserted in the right position. One of the popular algorithms for sorting, Merge sort follows a recursive pattern to come with a sorted array. The given list is split into two halves and repeatedly invokes merge sort on elements. After all sorted elements, it is merged to form a final array. Here you need to select an element (pivot) from a list, for example, the last element. Compare and place smaller elements before and higher elements after that pivot. Now repeat the process with the sections containing the smaller and higher elements to sort them out one by one. In the end, you will get a sorted group of data. Most of the sorting algorithms compare and place data at its right place. 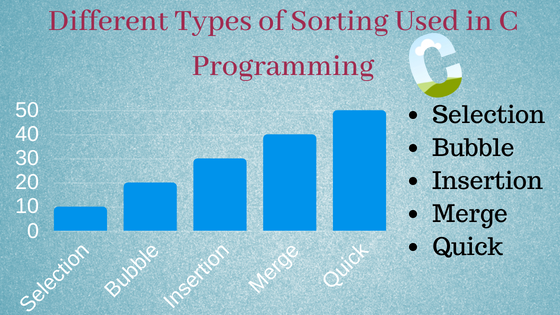 Above mentioned sorting algorithms help C programmers to come up with a sorted list of data. A sorted data offers simplified functions and operations of data in a C program.